I have been waiting and waiting for this to be ready and for the stars to align so I could test it. I LOVE a good Lox plate with a plain bagel but as it is not vegan I do not eat it anymore. I wanted to make something that would mimic it. 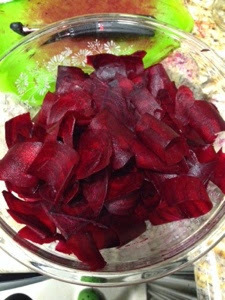 I had seen an instagram post about beets as lox but I couldn't find a recipe for it so I improvised and came up with something on my own. 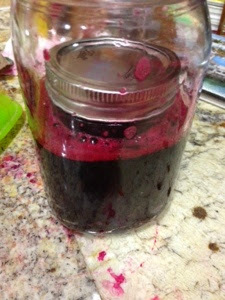 I decided to ferment the beet root the way I make sauerkraut. I wanted to test it out without adding any spice or flavor to see the consistency and how it tastes and feels when eaten like lox. I really liked it and it satisfied the craving. I wasn't a fan of the vegan cream cheese I used so I want to try another brand and see how it goes. 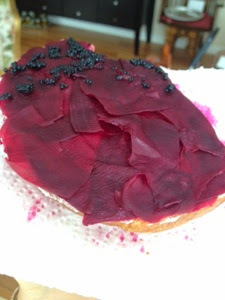 I also added vegan caviar to one part of it to see what the seaweed extract adds flavor wise- it didn't make much of a difference but I will try something with seaweed when I ferment the beet root again (maybe use actual seaweed). Overall, it ended up being good and I really enjoyed it. 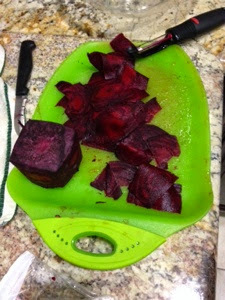 I used a peeler to make thin slices of the beet root. Put the shavings and salt together in a bowl and massage until soft- 5-10mins. let sit in the bowl for 10mins then stuff in a jar. place something heavy on top to weigh it down till the liquid covers all the shavings. 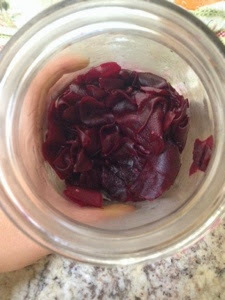 Store in a cool dark place for at least 7 days then refrigerate and let sit for 2 weeks before use. I will experiment with spices and flavors to get it to taste more fishy/oceany and report back.